A good surgeon is also a good physician. The best surgical results are often obtained by optimizing medical treatment both preoperatively and postoperatively (Fig. 1.1a, b). Optimizing medical treatment before surgery makes it less traumatic, reduces the chances of complications, and helps preserve olfactory mucosa. In order to optimize medical treatment, the surgeon needs to have an understanding of the mucosal disease. Postoperative medical treatment is frequently required to maintain the improvement that surgery produces. The surgeon needs to have a good understanding of mucosal disease. History and examination should allow basic categorization of the disease present, but they are often insufficient to make an accurate diagnosis. It is often necessary to undertake other investigations (see Chapter 3) or to have a trial of medical treatment to clarify the underlying pathology. Each of the clinical appearances shown in Table 1.1 can be associated with different pathological processes (Fig. 1.2a-f). 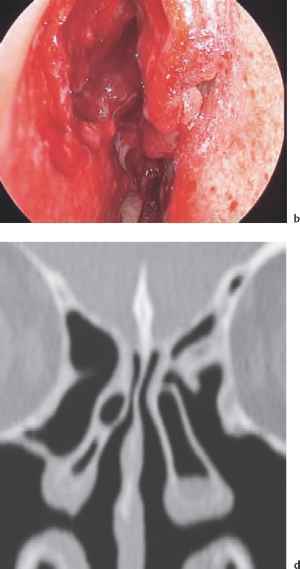 Try to arrive at a diagnosis that fits into one of the broad groups that are used for the classification of rhinosinusitis. These groups are shown in Table 1.2. Fig. 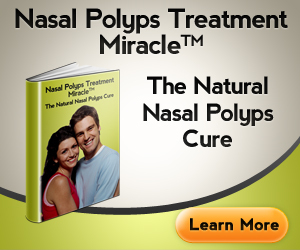 1.1 Nasal polyps a before and b after medical treatment. Fig. 1.2 a Idiopathic rhinitis with erythema. b Hyperplastic mucosa due to allergic rhinitis. c Severe hypertrophy with edema. d Polyposis in a nonatopic patient. e Granular mucosa. f Dry mucosa. obtain an idea of the underlying pathology (Table 1.3; Figs. 1.3a-d, 1.4a-d). Based on this, medical and surgical treatment can be maximized. Fig. 1.3 a Normal middle meatus. b Serous secretions in marked allergic rhinitis. c Purulent bacterial secretions. d Purulent fungal secretions. Primary symptom is rhinorrhea often reduced by ipratropium bromide; few other nasal symptoms; patients often elderly. Important not to include in idiopathic group. there is often bony erosion as well. 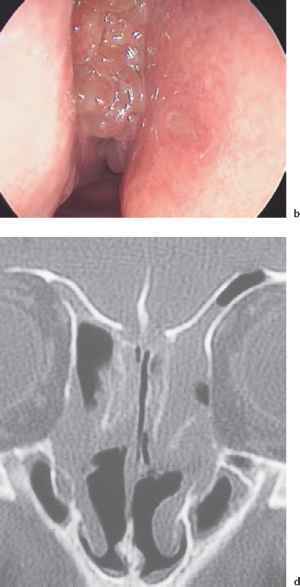 d Collapse of the nasal dorsum often seen in nasal Wegener granulomatosis. It is important to rank these symptoms in their order of priority to the patient. This not only helps to make a diagnosis, but it focuses the surgeon's mind on how best to meet the patient's needs—underline the patient's main complaint. Fig. 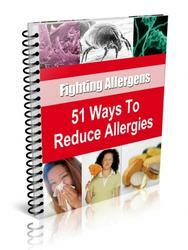 1.5 a The amount of secretions produced per day. b Postnasal mucus in the pharynx. c Mucociliary pathways of mucus. The patient's priorities may differ from what the surgeon can achieve. 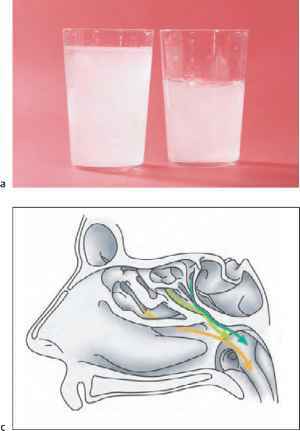 For example, the patient's main concern might be their postnasal discharge, but the surgeon may only be able to improve the symptoms of obstruction with little alteration to the postnasal drip (Fig. 1.5a-d). It is therefore vital that the surgeon is forthcoming and makes it as clear as possible to the patient which symptoms can and cannot be improved or resolved. When the physician overlooks this prior to treatment, the patient is likely to be disappointed with the outcome. Be aware that some patients may believe that even symptoms that they have not mentioned will be cured. The patient's expectations should coincide with the surgeon's prognosis. Thus, it is worth communicating to them which specific symptoms will not be helped. d Purulent secretions from the middle meatus tracking over clear secretions. While it is accepted that medical treatment will complement surgery in making the mucosa as healthy as possible, it is less well recognized that it can be a useful predictor of what can be achieved by surgery. For example, in a patient with anosmia and nasal polypo-sis, the use of oral and topical steroids can indicate the patient's remaining olfactory potential. If the patient has no sense of smell after a course of oral steroids (Fig. 1.6a-d), not even temporarily, then the surgeon must be very guarded in promising the patient that their sense of smell will be improved by surgery. There is a price to be paid for extensive tissue removal. That price may include the loss of olfactory mucosa, frontonasal stenosis, altered sensation, dryness, and an increased risk of violating the boundaries of the paranasal sinuses (Fig. 1.7a, b). that it is often possible to preserve valuable tissue, such as mucosa in the olfactory cleft, that might otherwise be removed (Fig. 1.8a-d). Far less surgery is needed if medical treatment has been successful. Morbidity can be caused by poor surgical technique, but it can also arise from excessive tissue removal. Good surgical technique is based on setting explicit goals and achieving these with the minimal amount of tissue trauma. Fig. 1.7 a Endoscopic and b CT views after overzealous removal of olfactory mucosa. Fig. 1.8 a Right nasal airway showing severe nasal polyposis after oral steroids just prior to surgery. b Peroperative view after ethmoidectomy. c Peroperative gentle lateralization of the middle turbinate (note preservation of olfactory mucosa). d Postoperative CT view to show open olfactory cleft. Fig. 1.9 a Use of Hajek forceps to neatly remove the mucosa and bone of a right uncinate process. b Through-cutting forceps joining natural and accessory ostia. Fig. 1.10 a Nasal polyps in the olfactory area medial to the middle turbinate, deliberately not removed at surgery. b The superior turbinate can now be seen after lateralization of the middle turbinate along with 2 months of topical nasal steroids. • Punching tissue rather than tearing it. • Preserving mucosal integrity in the frontonasal recess. • Avoiding mucosal damage to adjacent surfaces (Fig. 1.9a, b). The surgeon must be aware of the variations in anatomy that can occur and the potential to cause damage to the surrounding structures (see further discussion in Chapter 6). Surgeons unfortunately often underestimate the importance of sense of smell to the patients. It is a sense that is all too often forgotten and may escape the notice of both surgeons and patients. The reason may be that the loss of this sense often creeps up on the patient slowly or that the patient does not recognize that this loss is responsible for the reduced enjoyment of food. In any case, the rewards for patients in preserving or restoring their sense of smell are enormous. mucosa contact and restore mucociliary clearance, remove diseased tissue, and allow access to topical nasal treatment, but surgery in and of itself cannot cure intrinsic nasal disease (Fig. 1.10a, b). Patients need to be made aware of the need for continuing treatment in order to achieve the best possible result and an improved quality of life. 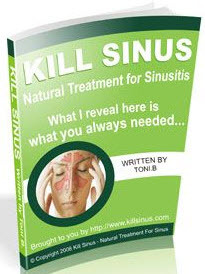 One way of getting this message across to your patients with intrinsic mucosal disease is to tell them that it is like "asthma of the nose," and they will need to keep the lining under control by regular medical treatment. This will help to prevent disappointment. Can you see nasal polyps from your nose? Are you able to see nasal middle turbinates with nakef? Does change in hormones causes to nakef?